I truly love Sunglasses; always have and probably always will. Very rarely will you ever find me not wearing a pair, regardless of which season we are in or whether it is cloudy or sunny outside. I love sunglasses as an accessory; in fact they maybe my favourite accessory. Protect your eyes first. Sunglasses protect your eyes which is most important. The sun produces 3 kinds of light, UV (ultraviolet rays), Blue Light, and Bright or intense light. My eyes are very sensitive to bright light, which is why I need to wear sunglasses all the time. Health Canada has great information on the importance of sunglasses and this link will provide more information including standards for UV protection and how light can damage your eyes. Next Frame you face to best accessorize your look. Sunglasses are now a multi -billion dollar industry. There are so many companies, designers, styles, shapes, sizes, and of course, price points to chose from. So how does one decide how to purchase that pair of shades? The best advice once you decide on your need and budget is to try, try, try! Different frames work better on certain face shapes however use this as a guideline it is worth trying on a variety. A rule to consider is matching your face shape with the glass frame i.e. a square face shape suits a square frame. No two faces are the same, which is why some frames better frame your face, and thus look good. It is important that you like them and feel comfortable wearing them. This will be the first thing people notice about you, so work it to your advantage. 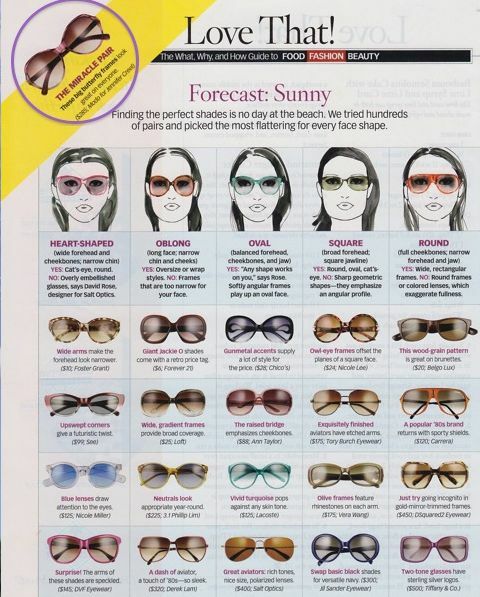 There are many options on where to buy your Sunglasses. Department stores like Nordstroms carry many Designer frames, Specialty shops located in most major shopping center such as Sunglass Hut carry a variety of sunglasses. Many clothing retailers such as Forever 21 and H&M have now expanded their lines to include sunglasses, you may also consider online shopping for your new pair. Net-a-porter is a very popular site for designer sunglasses. You could also consider adopting the latest trend: “renting” your sunglasses. The premise is to wear the latest styles and shapes and then exchange them for a new pair. There is a monthly fee as well as an option to purchase. For more information check out Ditto. For prescription lenses you can visit an Optician or an Optometrists office. Click here for the difference between an Optician and Optometrist. Most carry several lines of eyeglass frames including Sunglasses, prescription or non-prescription. Did you know that in Ontario Optometrists offices can only sell you frames and lenses at their cost? Click here more information on why glasses can cost so much. 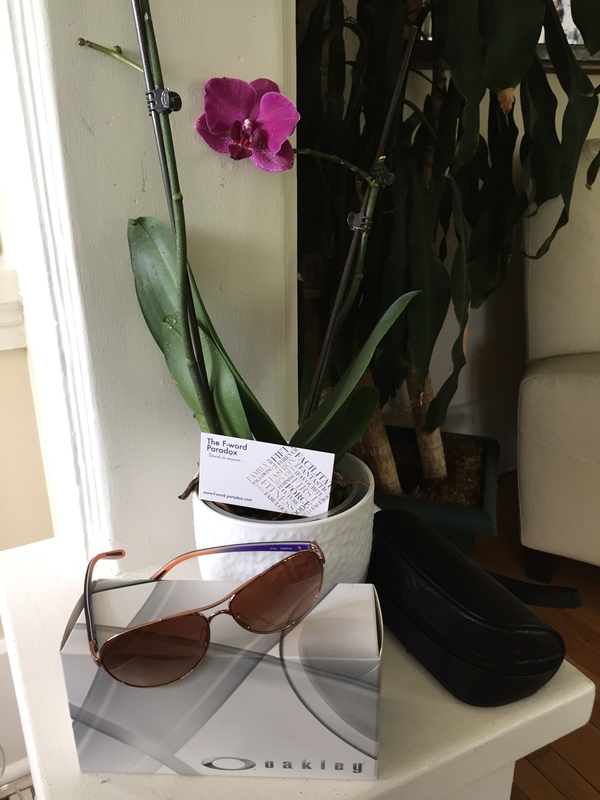 Here is something for my readers this sunglass season: The F-Word Paradox is having a Giveaway; you have a chance to win these fabulous women’s Oakley Sunglasses – pictured above. To enter simply subscribe to my blog. A winner will be selected on the First day of summer, Monday June 20th, 2016. The winner will be notified via email. However you decide to Frame your Summer just remember to always Protect your eyes and then Frame your Face for the best look.